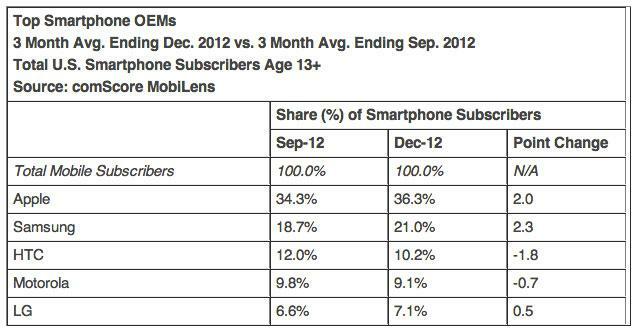 The data from comScore's MobiLens service shows Apple's iPhone maintained its dominance of the U.S. smartphone market for the three months ending in December, bumping its share 2 percent from the previous quarter to account for 36.3 percent of all subscribers. Samsung saw the most positive change over quarter four, capturing 21 percent of the overall market, up 2.3 percent quarter-to-quarter. The top two manufacturers were trailed by HTC and Motorola, which both suffered declines to end the year with respective market shares of 10.2 percent and 9.1 percent. As for mobile platforms, the study found that Android retained its number one spot, with the mobile operating system running on over half of all smartphones in the U.S. Apple's iOS made the greatest quarterly gains, however, moving from a 34.3 percent share at the end of September to 36.3 percent by year's end. 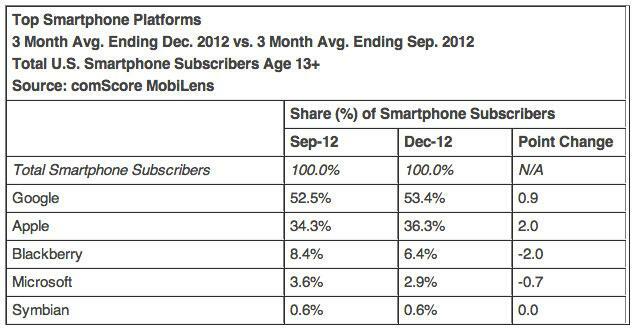 In comparison, Android saw a 0.9 percent change, upping its share from 52.5 percent to 53.4 percent over the same period. BlackBerry saw the biggest drop, falling 2 percent from 8.4 percent to end the quarter with a marketshare of 6.4 percent. The embattled company, which recently changed its name from Research in Motion to BlackBerry, released the Z10 on Wednesday. The device is the first handset in the company's next-generation smartphone and will make its way into the U.S. in mid-March. The firm said 125.9 million people in the U.S. owned smartphones during the three months ending in December, which equated to 54 percent of all mobile phone subscribers in the country.